by Meerah Powell Follow OPB March 22, 2019 7:14 a.m. | Canby, Ore. The Canby Ferry is a piece of Oregon history, but it's also costing Clackamas County about $400,000 a year. The county is trying to figure out if it can make up the difference. It sees an average of 50,000 riders a year, but that hasn’t been enough to weigh its profits from losses. “It varies greatly how much the revenues from tolls fall short of costs. Roughly the average is from $300,000 to $400,000 a year,” said Mike Bezner, Clackamas County’s assistant director of transportation. The difference comes out of the county’s road fund. 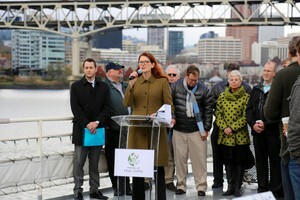 A feasibility study found the ferry is expected to cost more than $16 million in the span of 2025 to 2049. That includes maintenance, operations and personnel costs as well as a ferry replacement slated to fall somewhere within those years. The ferry runs seven days a week from 6:30 a.m. to 8:30 p.m. as often as commuters show up on either side of the river, but its hours can vary depending on the time of year. It also doesn’t run in inclement weather or when the river level is 70 feet or higher. 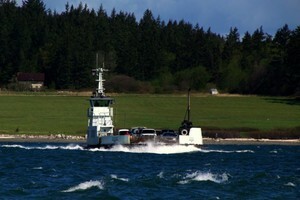 Mike Bezner (left) and Randy Harmon ride the Canby Ferry. Valerie Lindon and her daughter Shelby ride the Canby Ferry to Shelby’s middle school in Tualatin. 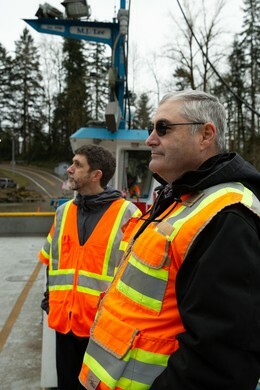 Ferry operator Lawrence Welch welcomes commuters to alight the Canby Ferry on March 14, 2019. Ferry operator Lawrence Welch pilots the Canby Ferry during the afternoon commute on March 14, 2019.